Observation - Female mallard and friend - UK and Ireland. 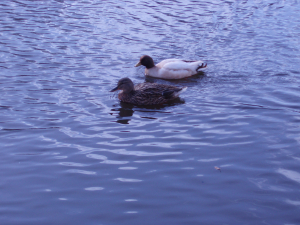 Description: White duck now has a lady friend. He's been alone on the icy canal all winter.Is he a white mallard? White duck now has a lady friend. He's been alone on the icy canal all winter.Is he a white mallard?